April 27, 2010 -- After hearing from citizens and organizations, the Park Authority has added some but not all environmental features to their maps showing proposed recreation uses at Silver Lake. 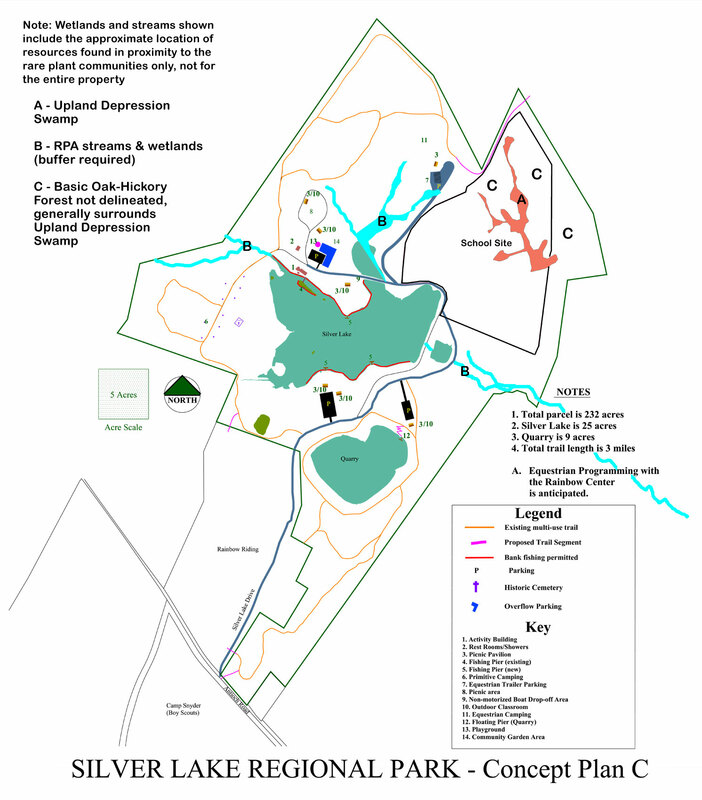 As an example, the map to the right overlays wetlands identified by the National Wetlands Inventory onto the Park Authority map. The Park Authority has had good opportunity to benefit from the advice of natural resource professionals at Silver Lake, including field visits with state experts. In addition, Prince William resident and recognized natural resources specialist Charles Smith completed and submitted a preliminary plant list, made recommendations for managing natural resources and discovered globally rare natural areas, which are not all shown on the current Park Authority maps. 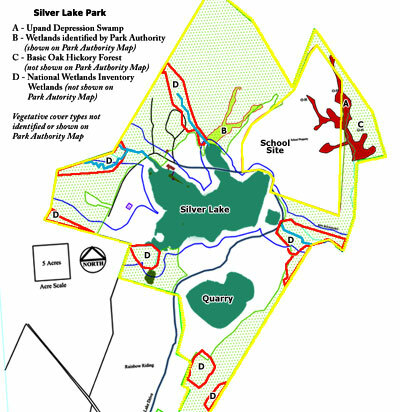 We recommend that the Park Authority acknowledge and consider the information provided by local and state experts, complete an assessment identifying natural resources, make this information available to the public and prepare new proposals that honor the County's commitments to manage Silver Lake as a Resource Based Park. On Wednesday, April 28, the Park Authority Board is scheduled to vote on Silver Lake recreation uses based on the incomplete information provided by their staff. Click here to email Board members and share your views. March 23, 2010 -- The Park Authority will review proposals to define recreation uses at Silver Lake on Wednesday, March 24, 7:30 p.m. at their Helwig Park headquarters. Silver Lake is a great park that’s been getting lots of attention. Clearly Gainesville residents were ready for horseback riding and a nature park close to home. It’s taken a long time to get to this point. The road to Silver Lake Park was riddled with opportunities and challenges that presented Prince William County with choices many had not previously considered. Sad to say, one opportunity after another has passed by simply because most decision makers saw no need to actively pursue land conservation priorities. On the bright side, an encouraging number of public officials deserve recognition for supporting one or more opportunity to protect natural areas at Silver Lake and avoid budget increases. We have an experience to remember, lest we blow it again. Opportunity to double the total parkland acres and remove operating expenses from the County budget. Supporters include Supervisors Mike May, Marty Nohe,and Maureen Caddigan. Opportunity to discover globally rare natural areas at Silver Lake before the rezoning was approved and before the location of the school was decided. Supporters unknown until Supervisors vote on the draft Environment Chapter, which calls for baseline data and more information from developers. Opportunity for a land swap between the School Board and Park Authority to protect globally rare natural areas on parkland, after their 11th hour discovery. Supporters include School Board Members Gil Trenum and Don Richardson. Also, Prince William County Public Works Director Tom Brunn with Patty Dietz and Tom Dombrowski, who provided expert advice and environmental studies on very short notice. After years of controversy, the Park Authority owns Silver Lake and is planning recreation uses and facilities. What should citizens expect to see at Silver Lake? 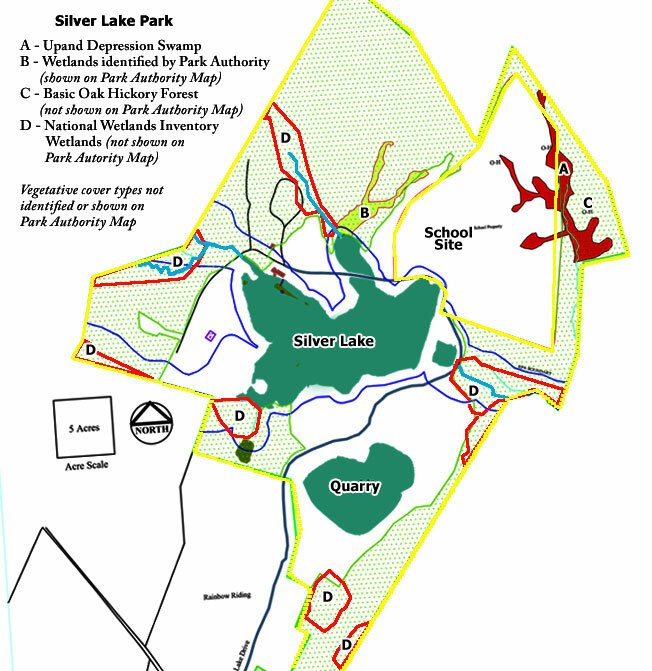 When Silver Lake was transferred to the Park Authority in 2009, Supervisors May and Nohe recommended deed restrictions to ensure citizens that recreation uses would be limited to passive uses, as highlighted during the rezoning. Although their proposal failed, the Board resolution transferring Silver Lake to the Park Authority emphasized passive recreation as a result of their efforts. This resolution provided the basis for the County’s proffer interpretation – or policy decision – defining recreation uses allowed at Silver Lake Park, which was initiated by Gainesville resident Jacob Frank. This interesting proffer interpretation sets the standard for reviewing the Park Authority’s current Master Plan proposals. It confirms that Silver Lake is a “resource-based” park where recreation is limited to passive uses, as defined by the Comprehensive Plan. According to the Comprehensive Plan, the intent of a resource-based park is to primarily preserve, protect, and interpret natural and/or cultural resources. Passive recreation includes those uses that generally require or result in little or no alteration of the landscape and produce little or no light, noise or visual intrusion on their surroundings. Passive uses may require trails, small footprint buildings for restrooms or visitor centers, parking, etc. Examples may include jogging, birding, photography, nature study, fishing, canoeing or kayaking (depending on the access needs), biking or horseback riding. The Park Authority’s Master Plan proposals should match these goals. If not, according to the proffer interpretation, Supervisors are required to vote on a new resolution for Silver Lake Park before planning or development could move forward. The Master Plan proposals should also identify and locate all natural features, which requires an inventory of the property. In fact, the Comprehensive Plan calls for inventories for parkland to identify rare, sensitive and high quality natural and cultural resources. The map on this page, here, shows some natural features found at Silver Lake, including the Upland Depression Swamp, but only hints at what might be found through an inventory of the entire site. Although none occurred at Silver Lake, Prince William resident and recognized habitat specialist Charles Smith discovered globally rare natural areas, which were subsequently confirmed by the Virginia Dept. of Conservation & Recreation Natural Heritage Division. What else might be out there? We can't be sure, the Park Authority’s current proposals do not show natural features or include information on an inventory. There's little or no information on the extent of recreation activities. What is equestrian camping and how much space does it require? What is an “Activity Building?” Where are all the streams, wetlands, forests and fields? Why would you park equestrian trailers near wetlands? Where are the high quality habitats? Are invasive plants a problem? How will natural areas be managed? There’s a lot of unanswered questions. Silver Lake Park has been a long time coming. It’s worth getting right this time. The Park Authority will review the proposals at their meeting Wednesday, March 24, 7:30 pm at their Helwig Park headquarters. Email Board members to share your views. Copy Supervisors so they know how their transfer of Silver Lake to the Park Authority is working out.